So, you somehow feel that the 64GB internal storage in your current smartphone is no longer enough to contain all the massive amount of apps and videos that you love to enjoy. Well, don’t fret…who knows, your next smartphone might feature a bigger 128GB internal storage such as this newly announced embedded memory from Samsung. With Universal Flash Storage (UFS) 2.0 as its interface, Samsung new UFS embedded memory not only comes with bigger storage but is also 2.7 times faster than eMMC 5.0 embedded memory which is one of the common choice for high-end smartphones at the moment. Despite being relatively fast, Samsung claims that its new solution takes less power up to 50 percent which is rather interesting. This doesn’t mean that the good old eMMC will be forgotten though. The Korean giant believes that high-end smartphone market will adopt UFS memory solution while eMMC will continue to cater lower tier devices. 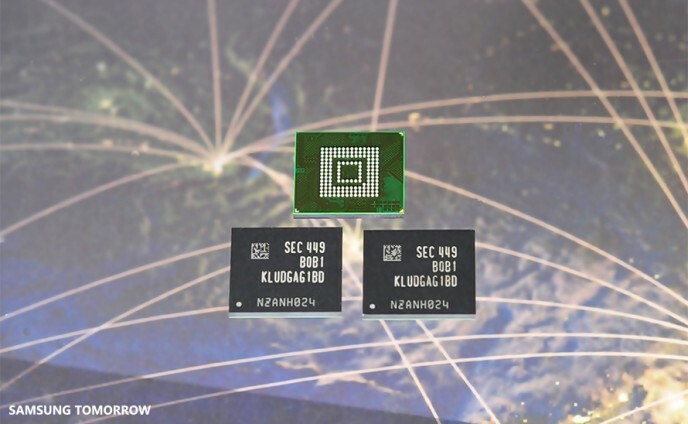 Apart from 128GB, Samsung’s new UFS embedded memory solution also comes in 32GB and 64GB capacities. The company didn’t mention if any of its upcoming devices will feature the new memory though (Galaxy S6, no?) but nevertheless, expect to see devices to feature UFS embedded memory in the market very soon.